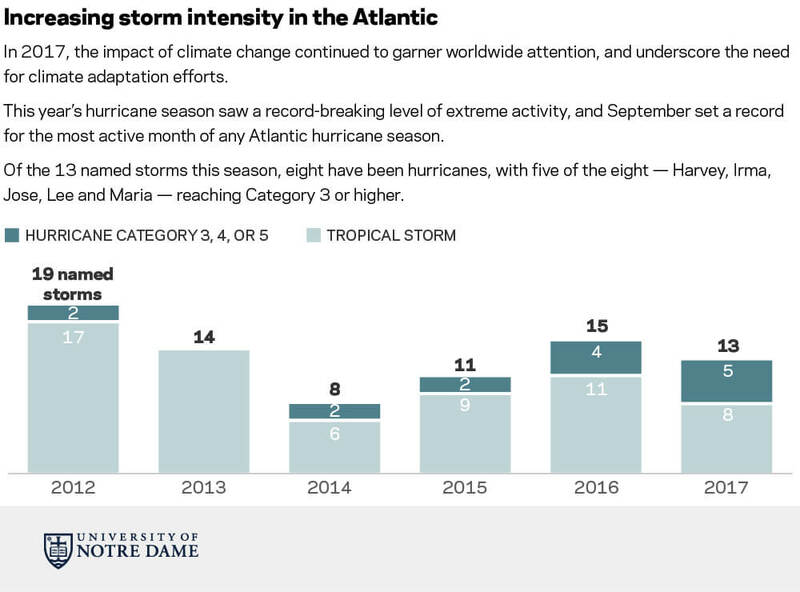 This year’s record-breaking hurricane season in the Caribbean has exacted a serious toll on island nations. In the Pacific, most small islands have shown increasing vulnerability on the ND-GAIN Index over the last five years, including Fiji, Maldives, Samoa, Tonga and Vanuatu. For small island states, superstorms paired with rising sea levels pose particularly daunting hazards. The ND-GAIN Country Index uses over 20 years of data across 45 indicators to rank 181 countries on vulnerability to extreme climate events and readiness to successfully implement adaptation solutions. By comparison, countries that have made the biggest gains as climate adaptors on the ND-GAIN Country Index over the last five years include several larger, inland and economically developing countries, such as the Democratic Republic of the Congo, Iran, Myanmar, Russia and Vietnam. Despite the increasing risk faced by coastal countries, island states around the world have taken action to prepare for climate threats. Jamaica, for example, has enhanced its adaptive capacity over the past decade with improvements in sanitation facilities and access to reliable drinking water. The country has simultaneously become less dependent on imported energy and now fares considerably better than the global average change in vulnerability. A full country ranking, as well as country profiles and visualization tools, is available at gain.nd.edu/country to help public and private sectors as they make investments for the common good. Extensive online tools allow users to compare climate risks and opportunities. Originally published by Alex Gumm at news.nd.edu on November 08, 2017.